Darkness shrouded the house tucked away in an obscure part of suburbia, and hundreds of crickets guarded the yard, chirping their warning to any potential intruder on this humid spring night. An afternoon shower had cleansed the air of pollen, giving allergy sufferers a respite for the first time in several weeks. Closed blinds shut off the house from the rest of the world, and a layer of thick curtains ensured the hardiest of snoopers would face difficulty trying to see inside. As a guest here, Keith did not know what the neighbors thought of all this secrecy, but he knew if someone like this lived next to him, his suspicions would always be raised. What hid behind the curtain? Seated in an antique rocking chair near the window, across from a wardrobe with a door cracked open, Keith took a sip of coffee, wondering what his hosts had wanted to talk to him about. Their secret? No, he knew it already. He had for three years now. Most days it did not matter to him anymore, and he dared not mention it in front of others lest he face their wrath. Their secret? They were not human. Which was not to say they were forever in hiding. No, James and his mate Mary, as well as their children, possessed the ability to appear human, although Keith did not understand how and his hosts refused to tell him. Because of this ability, they could go shopping, send the pups to school, and even attend church as a family. This was how Keith encountered them the first time. As one of the deacons, it was his job to meet newcomers. But he had not expected this. But, once he got past their grayish brown fur, pointed ears, fangs, claws, and their ability (and pumps propensity) to walk on four legs when it suited them, they weren’t so bad. And they were the only Coyotes in the area, as far as he knew. “Um…” Keith also leaned toward the Coyotes, tucking in his arms and putting his hands in his lap. “You are the only ones that I know of. Why, does the Committee think I should know another?” To date, he had received exactly three letters and one phone call from someone claiming to represent this secret organization. The letters always came in unmarked envelopes with no return address, and Keith would have assumed them fraudulent had James not stressed otherwise. James said the Committee always kept close tabs on humans authorized to know about the existence of their species. “No, it’s the least I can do.” He cupped the mug in his hands and walked to the kitchen with James. The Coyote’s ears were flat against his head, and the tip of his tail just barely touched the floor, about the equivalent of a furrowed brow and downturned lips for a human. “What’s going on?” Keith kept his voice low, although he guessed Diane would be able to hear their conversation. At the very least, he could keep David from comprehending. “I guess so. Thanks.” They embraced, James’ whiskers tickling Keith’s cheek. “Let me get that for you.” James reached around and took the mug from Keith and set it on the counter beside them. “Call me if you have any trouble with the Coyotes,” he said. This is another of the coyote stories I'd worked on some time ago. It also happens to be incomplete, I feel. 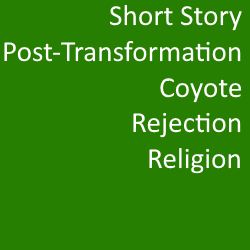 The idea is for the reader to get a different perspective on coyote life, now that you've seen the aftereffects of their exposure from the viewpoint of a cowardly coyote and his wife, and that of a distraught church-goer. This one takes place sometime before the events in those two stories, but I don't know how long. 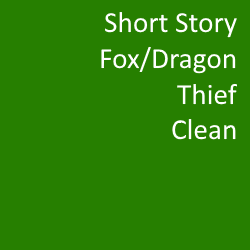 There are concepts mentioned here that are better explained in the novel I am currently re-writing, and in fact that's my goal - to release the novel at some future date.